Apply when drains will not be used for 6 to 8 hours (at bedtime for example).First time users, treat every drain 5 consecutive days. Maintenance: treat once per month. Mixing Bio-Clean with warm water works best. A 1-tablespoon scoop is included in each jar. 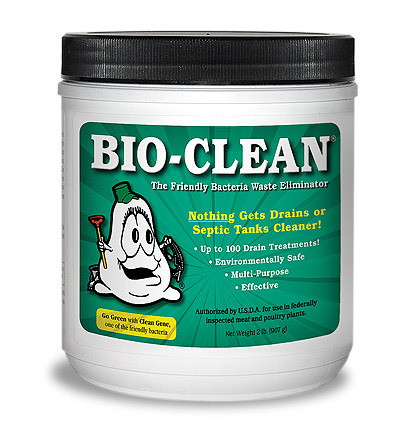 Sinks/Tub / Shower: Mix 1 tablespoon of Bio-Clean with 1 pint water. Floor Drains: Mix 3 tablespoons of Bio-Clean with 3 pints of water. Toilets: Mix 2 tablespoons Bio-Clean with 2 pints water. Pour mixture into toilet, then add 2 pints plain water to the bowl to push more of the product out of the toilet and into the sewer line. Do not flush for several hours. Garbage Disposals: Mix 1 tablespoon in 1 pint water. With disposal running, quickly dump in product and turn of disposal so product gets thrown onto side walls where food particles accumulate. Multi-Story Homes: Start the 5-day treatment in the basement (or first level) . Go up one floor and repeat until each floor has been treated for 5 days. Septic Tank/ Cesspool: Mix one jar (2 lb.) in 4 gallons water. Then pour into toilet and flush. Maintenance: add 2 cups every month to toilet bowl and flush. Septic Fields: Mix 2 lbs. Bio-Clean in 2 gallons water for every 50 feet of field pipe. Apply either through distribution box, vent pipes, or clean out. These directions and tips for other uses are found inside each jar of Bio-Clean.